I am staying with Daughter No 2 and her husband for a week or two to lend a helping hand in my new capacity as grandmother. Mother and baby are sleeping soundly so I have the chance to quickly write this! My daughter’s mother-in-law, amazing Turkish cook that she is, arrived yesterday shortly after we got home from the hospital bearing huge welcoming pots of dolma – stuffed courgettes and also stuffed vine leaves , and made a beautiful chicken noodle soup from scratch with fresh tomatoes and lots of parsley. Then she sat down and made a batch of köfte for the freezer. Can you imagine. It was one of those wonderfully kind Turkish gestures . BUT what I was really interested in was the traditional sweet drink that is served first in the hospital to help bring on the milk in the new mothers, and then made at home to offer guests. It is called Lohusa Şerbeti/pron: cher as in Sonny and Cher/bet which apparently translates as post-partum sherbet. The lohusa period here lasts 40 days: traditionally the baby doesn’t leave the house – and neither does the mother for that matter – during that time although I think times are changing as far as that goes. Anyway a huge glass container of this magic sherbet also appeared – we had to rearrange the fridge shelves so that it would fit. · Put the lohusa sugar, the regular sugar and water in a large pan and bring to the boil over medium heat. · Boil for 15 minutes until the sugar is dissolved, then continue for 15 minutes more on a lower heat. · Tie the cloves and cinnamon sticks in a muslin cloth and add to the pan. Simmer for a further 15 minutes. 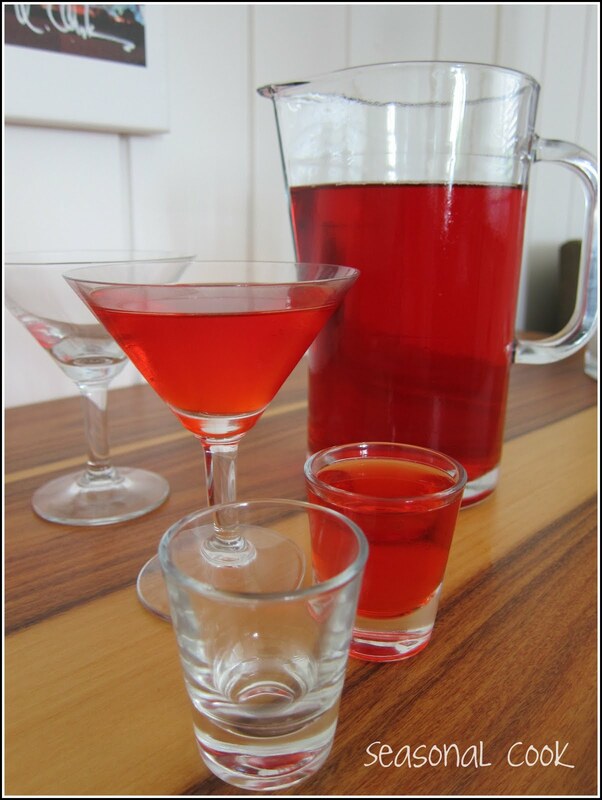 · Cool and then strain into a large container or jug. This amount makes a lot! Keep in the fridge. It’s served hot, cold or at room temperature. The colour will be a gorgeous ruby red. 1. 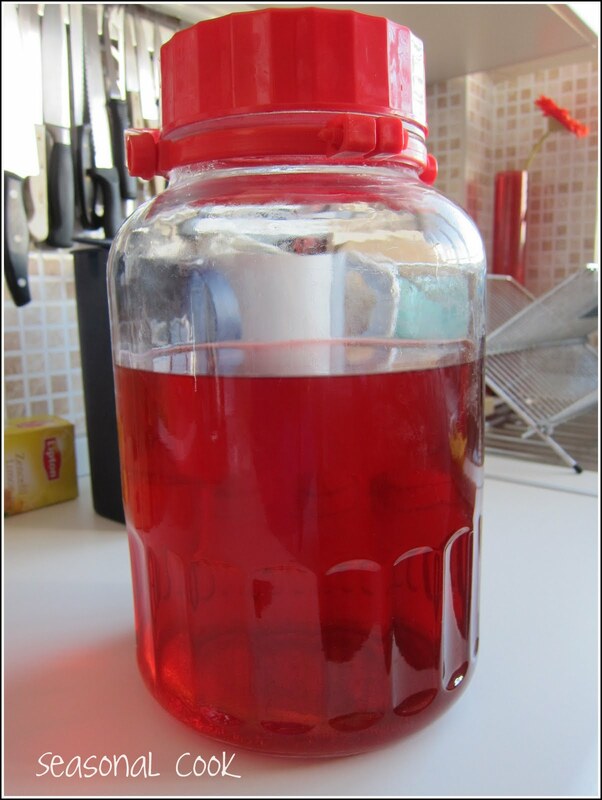 In this case, the special lohusa sugar which is pinkish red in colour was bought from Hacı Bekir, a traditional shop selling Turkish Delight and other enticing local sweets. It can also be found in the Spice Market or Mısır Çarşısı in Istanbul and I am sure in other traditional places too. I wish I had seen it with my own eyes so I could have photographed it. 2. I had a quick look at some other recipes for this sherbet and see that they all require much more sugar than this one. Up to 5 water glasses or 5 cups! 3. I was served it myself last week in another home with a new baby and it came with a choice of crushed almonds or walnuts sprinkled on top which was rather nice. I somehow have the feeling that I’m not going to be able to cook my Alice Waters recipe for this Friday although I had started reading up about her and thought her whole philosophy was just up my street. But one little snippet: turns out that my American niece who is now in Berkeley has a flatmate who will be starting a job at Chez Panisse in September! How interesting Claudia, I didn't know about this tradition. Do you know what it is that helps bring the mother's milk in and if it really works? Obviously that amount of sugar must do wonders for tired new mothers and grandmothers helping out! I had gallons of that stuff around the house when my son was born. Nonetheless, my milk didn't drop until a few hours after we sent my mother-in-law home 5 days later. Some stress issues there. first of all, HUGE congratulations to you! I'm sure you'll have so much fun being with your daughter and granddaughter! And that drink sounds so delicious! The perfect way to celebrate! Hey hello Yasemin!! Yes, the sweetness is certainly part of it but it is a really old tradition so there must be more to it. Ayşe isn't so keen on the cinnamony taste here. I like it because it isn't as sweet as I thought it was going to be. Stranger – as usual, your remarks crack me up.But you must admit it is really helpful to have all that food on hand. Love the idea of all that aşure sitting on the balcony!! Joanne, thanks for your warm congrats! Congrtulations! We have similar traditions in South India. Our preparations are less 'tastier' than this sherbet! This sounds delightful.